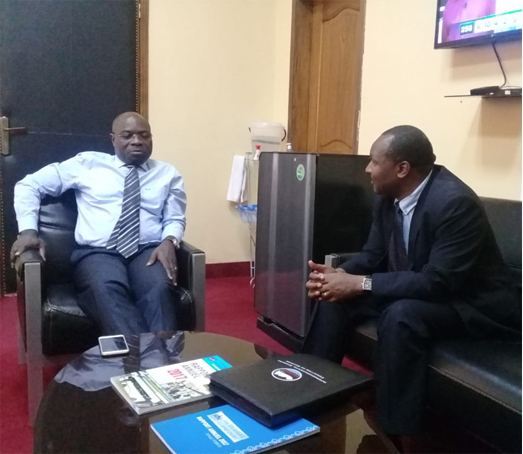 A Delegation from Northern Corridor Transit and Transport Coordination Authority (NCTTCA) Secretariat led by Mr. OMAE NYARANDI, the Executive Secretary, on 29th October 2018, travelled to Kinshasa to meet Officials from the Ministries of Transport and Infrastructure and different Stakeholders in the Democratic Republic of Congo (DRC) to advocate for the Development of the Mbarara-Kisangani Road Network and exchange views on matters of mutual concerns and interests of DRC as a strategic Northern Corridor Member State in terms of business opportunities. NCTTCA Delegation led by Mr. OMAE NYARANDI, Executive Secretary, accompanied by CEPCOR high raking officials in working discussions with Hon. Rex KUFULULA MAKILA, Director of Cabinet, office of the Deputy Prime Minister and Minister of Transport and Communication, Kinshasa, 29th October 2018. The purpose of the NCTTCA delegation working visit was mainly to share information and get updates on the infrastructure projects on the Mbarara-Kisangani Road Network and get assurances of high level commitments for bilateral discussions between the Democratic Republic of Congo and the Republic of Uganda. The ultimate goal being to strengthen good working relationship between the NCTTCA and the Member State of DRC and different stakeholders in that country. 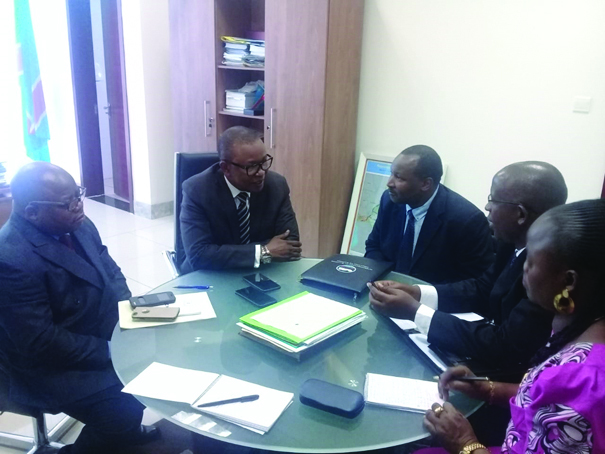 NCTTCA Delegation in working discussions with Mr. Donat BAGULA, Secrétaire Général (PS), Ministry of Transport and Communication, Kinshasa, 29th October 2018. The working visit was anchored on the framework of a directive by the 30th sitting of the Northern Corridor Council of Ministers held in Mombasa, Kenya, on 3rd August 2018, tasking the NCTTCA Secretariat to work closely with the Member States of the Democratic Republic of Congo and the Republic of Uganda to mobilise funds from the Development partners in order to promote cross-border transport infrastructure, especially the upgrading of the Mbarara-Kisangani Road Network. NCTTCA Delegation accompanied by CEPCOR officials in working discussions with Hon. MANTEZOLO DIATEZUA PAPY, Deputy Minister of Infrastructure, Kinshasa, 29th October 2018. The Northern Corridor Road Sections of Mbarara-Bushenyi-Kikorongo-Mpondwe-Kasindi-Beni-Komanda-Kisangani (940Km) form a very key Road Network that is also part of the 6,000 kilometres Trans-African Highway from Lagos, in the Federal Republic of Nigeria to Mombasa, in the Republic of Kenya. The Road Network is of prime importance for the intra-regional and trans-African trade. 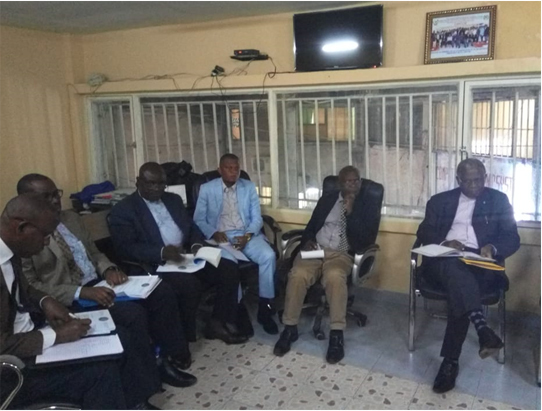 NCTTCA Experts meeting with DRC Stakeholders representatives from CEPCOR, OGEFREM, Road Authority, Road Fund (FONER), Ministry of Trade and Federation of Congolese Companies (FEC), Kinshasa, 30th October 2018. Inside DRC, the Northern Corridor Road Network Kasindi-Beni-Komanda-Kisangani is approximately 760km long. The most part of this section of the Corridor is a Class II unpaved road in Eastern DRC. Its unpaved condition puts it in a category below a road of international status and is therefore in need of upgrading to Class 1 paved standard. In Uganda, the Northern Corridor Road Section Mbarara-Bushenyi-Kikorongo-Mpondwe with a spur to Kasese is approximately 180km long. This section of the corridor is a Class II Paved road in Western Uganda. The most part the road is in a fairly condition with the exception of the Bushenyi-Katunguru section which is in poor condition and in need of reconstruction. The NCTTCA Secretariat has therefore embarked on activities of engaging different Ministries and Stakeholders in both DRC and Uganda for the successful preparation and organisation of a tripartite meeting bringing together the Governments of the Democratic Republic of Congo and the Republic of Uganda and Development Partners for support and commitment to implement this huge but important transport infrastructure project. Improvement of Security and Road Safety along the Corridor, the designated Road Network area having suffered from insecurity for many years. Enhancement of Road status on the missing link along the Trans-African Highway linking the Port of Mombasa in Kenya to Lagos in Nigeria. Creation of jobs for the growing population in the region. Increase in value of agricultural produce due to improved access to local and international markets thus reducing the imports-exports deficit in the region. Increase of the Intra-African trade thus boosting socio-economic development on the continent. Improvement of trade conditions and revenue for women and youth between DRC and Uganda along the Northern Corridor through the implementation of the NCTTCA’s programme aiming at promoting intra-regional trade with emphasis on gender. The high level officials in the Ministries of Infrastructure and Transport reiterated strong commitment of the DRC Government to open up the eastern part of the country to regional and international market by developing and upgrading the DRC Northern Corridor Road section of Mbarara-Kisangani road. They revealed the ongoing high level initial discussions with development partners such as the AfDB to financially support the development of some sections of that Road Network inside DRC. The DRC Government officials were very happy that the NCTTCA embarked on activities to promote the development of the Transport Infrastructure. They accepted the NCTTCA intervention and asked the Secretariat to take the lead in the organisation and preparation of the bilateral Meetings and Tripartite funds mobilisation process. DRC urged the NCTTCA Secretariat to improve and strengthen good working relationships in the interests of all the Northern Corridor Member States, especially in rolling out different programmes intended to facilitate trade and ease the movement of goods and persons and very importantly the roll out of the Northern Corridor Dashboard for the corridor Performance Monitoring.